Wow, what a fun book this was to read! I was pleasantly surprised and wondered why I waited so long to try this series out. Oh wait, I'm not really surprised. The cheesy cover and title really threw me off. Let's just say that judging a book by its cover is not always the smartest thing to do.Our heroine finds herself unwillingly made a vampire to prevent her own death, shortly after she's been attacked by another rogue vampire. Once she finds out what has happened to her, she tries to continue on with her old life, only to find that this is "not allowed" within vampire society. Within days, she is whisked off into a world of politics and submission that she wants absolutely no part of. 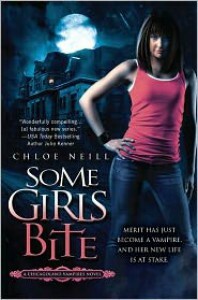 When she finds herself in strong opposition to the heirarchy of her not-so-secret-anymore society, she finds herself locked in a battle with the vampire that has created her.I am such a lover of strong heroines, and this book doesn't disappoint. I also have a weakness for arrogant and testy men, and again, this book doesn't disappoint. This series shows potential to be full of action, mystery and suspense.